Compact beast. Compact or powerful? The Schenker XMG C405 is both. This 14-inch model runs all the latest games but we recommend using headphones. 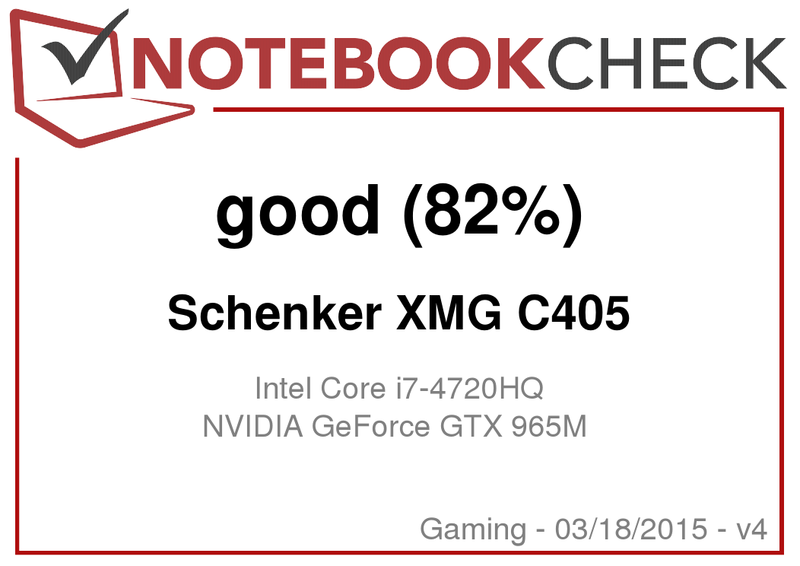 The Schenker XMG C405 is a powerful, compact 14-inch gaming laptop. Like the predecessor, the C404, the test model is based on the P34 barebone from the manufacturer, Gigabyte. Our test model is equipped with a GeForce GTX 965M and Schenker also offers a configuration with the GeForce GTX 970M. We tested this GPU in the Gigabyte P34W v3. As the name suggests, Gigabyte uses the same barebone. The competitors of the XMG C405 belong to the Top 10 list of lightweight gaming notebooks: the MSI GS60 2QE Ghost Pro 4K and the Acer Aspire V15 Nitro VN7-591G. As the Schenker XMG C405 has the same barebone as its predecessor, we will skip a few sections which have not changed: the case, the connectivity, the input devices, the display and the speakers. Information about these sections can be found in the reviews of the Schenker XMG C404 and the Gigabyte P34G v2. The XMG C405 uses the same panel as the predecessor. The values are a little different which is not unusual, given the fact that two panels can never have the exact same values. The Schenker XMG C405 is a compact, mobile 14-inch gaming notebook. It can run any of the latest games fluidly. Our test configuration is available for 1,878 Euros (~$2049). The Schenker homepage offers various configuration options and the basic configuration of this model is available for 1,549 Euros (~$1690). A GeForce GTX 970M adds around 166 Euros (~$181) to the price. The C405 contains an Intel Core i7-4720HQ quad-core CPU (Haswell). This is a "standard" CPU with a TDP value of 47 W. The processor operates at 2.6 GHz and Turbo allows the processor to boost up to 3.4 GHz (four cores), 3.5 GHz (two cores) and 3.6 GHz (one core). Turbo is only possible when the laptop is plugged in. The CPU tests of the Cinebench benchmark are run at 3.4 GHz (single-thread) and 2.8 to 3.1 GHz (multi-thread), which means that the full potential of the processor is never utilized in multi-thread applications. On battery, the C405 runs the CPU tests at 2.6 GHz. A stronger processor and faster SSD ensure that the system runs smoothly. The results of the PCMark tests are very good. It is hardly possible to increase the system performance any more. The only possibility is to increase the DDR3-RAM modules to 16 GB. However, we recommend using fast RAM modules. An mSATA Solid State Drive is the storage device for this laptop. The Schenker online shop offers various configurations. Our test model uses a 256 GB Crucial SSD. The SSD has very good transfer rates and leaves no room for complaint. The C405 has a free 2.5-inch slot which can be used for an additional storage device. Once again, Schenker offers various configurations for the second slot. Our test configuration uses a HGST drive (1 TB, 7,200 rpm). Both storage devices can be swapped out. The Intel HD Graphics 4600 and the Nvidia GeForce GTX 965M use switchable graphics (Optimus). The Intel graphics chip requires relatively little energy and is useful in everyday use or when the laptop is running on battery. The GeForce GPU is useful when running demanding programs which require a lot of graphics performance. 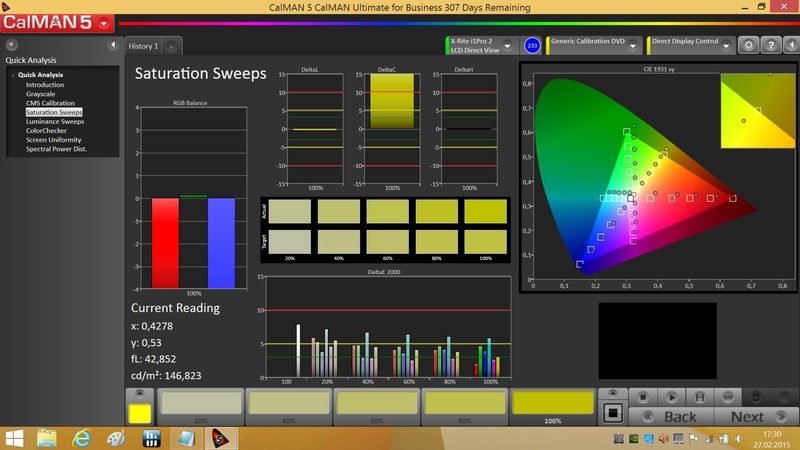 The Optimus system runs smoothly and switches between the graphics chips automatically (when necessary). The GeForce GTX 965M belongs to the top tier of graphics cards, but it is the lowest of them all. It runs at a base clock speed of 924 MHz. Turbo allows the chip to be boosted up to 949 MHz. The GPU uses the internal 2,048 MB GDDR5 RAM (128-bit interface). The 3DMark results are normal, considering the hardware. The hardware of the laptop is strong enough to ensure good gaming performance. Most games will run with the Full HD resolution and high/very high quality settings. Assassin's Creed Unity is an exception and the user needs to lower the resolution and quality settings to ensure a playable fps. While the C405 is idle, the fan shuts off now and then. In normal use, the fan is audible and at load, it becomes quite loud. During the stress test, we measure a noise emission of 54.4 dB. We recommend using headphones as at full load the fan can be quite noisy. The predecessor has a far lower noise emission. Hint: Owners of the XMG C405 can control the fan behavior. The Gigabyte Smart Manager offers four fan profiles. We ran all our tests with the "Normal" profile. If you choose the "Xtreme" profile, the fans will run at max speed all the time. The stress test (Prime95 and Furmark run for at least an hour simultaneously) is run by the C405 the same way when plugged in and when running on battery: at the start the CPU and GPU speeds vary a lot. After a few minutes, the graphics chip hits its max speed (949 MHz). 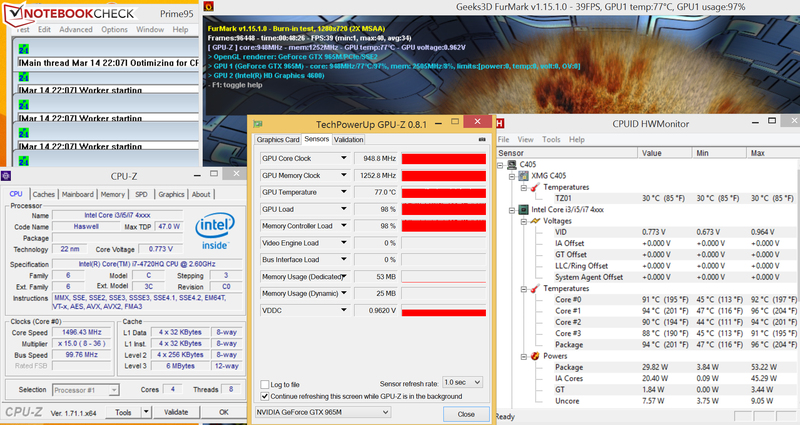 The speed of the CPU sinks from 2.0 - 2.5 GHz to 1.2 - 1.6 GHz. During the stress test, the device crosses the 50 °C mark at many different spots on the bottom of the case. As such, we do not recommend using the notebook on the lap. In terms of heating up, the predecessor has similar issues. (±) In idle usage, the average temperature for the upper side is 32.7 °C / 91 F, compared to the device average of 32.9 °C / 91 F.
(-) The average temperature of the palmrest area of similar devices was 28.7 °C / 83.7 F (-6.7 °C / -12 F). The C405 requires quite a lot of power, which is not surprising given the hardware under the hood. While idle, the power consumption is high (27.3 W). At full load, the consumption rises to up to 152 W. Due to the CPU throttling, the consumption drops as the test goes on. All-in-all, the C405 requires a little more energy than the predecessor, the C404. In our practical WLAN test, in which we execute a script which loads a random website every 40 seconds, the laptop lasts 3:56 hours, which means it falls just short of the predecessor (4:08 h). 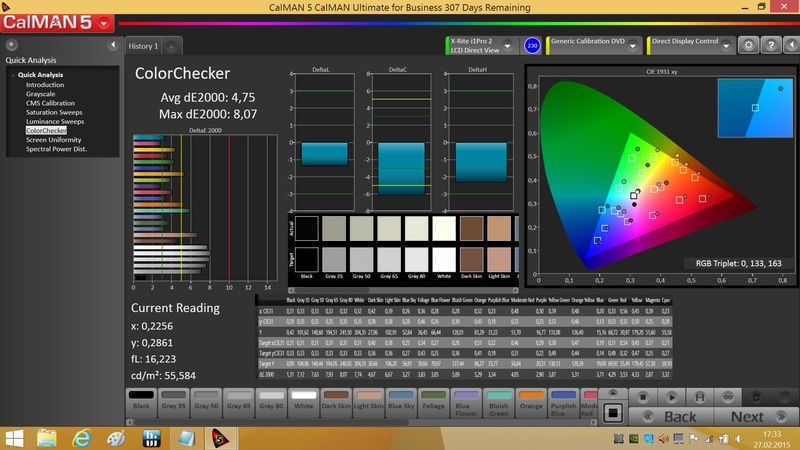 The test is run with the "Balanced" profile and brightness set to 150 cd/m². - .. but it heats up a lot at full load. - Very loud at load. Schenker XMG C405. Test model provided by Schenker Technologies. 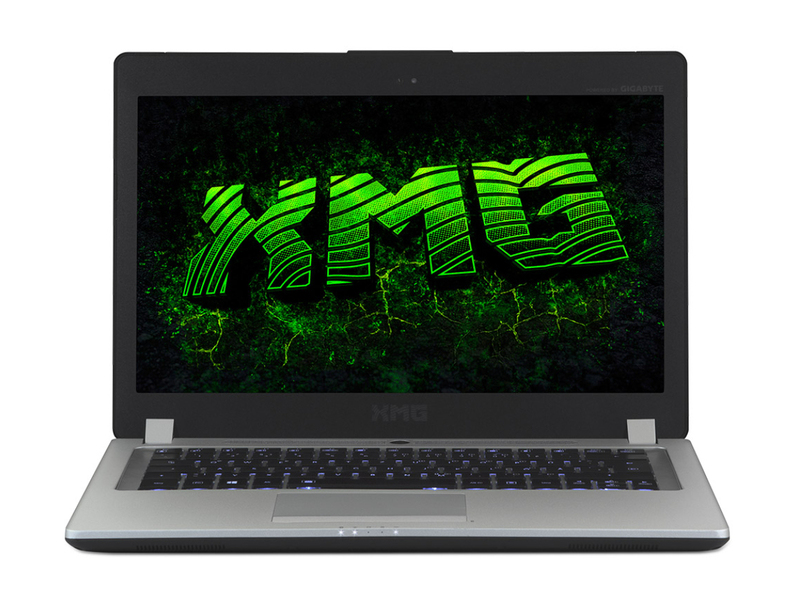 The Schenker XMG C405 is a compact, powerful 14-inch gaming model. The Intel quad-core processor ensures great performance with all applications. The high-end Nvidia graphics card can run almost all of the latest games fluidly with max settings. Of course, at this point the laptop does not run quietly or coolly. 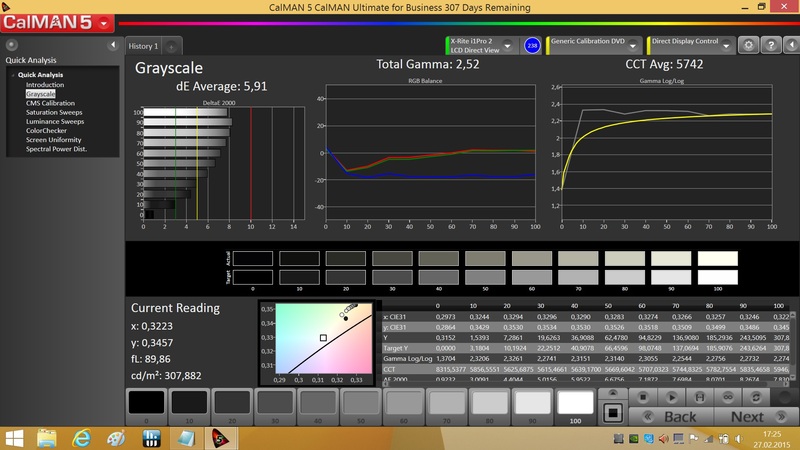 The power consumption is quite a lot higher than that of all-rounder notebooks which use ULV hardware. The AHVA panel offers great viewing angles and an acceptable brightness and contrast. We like the slim case which offers the user easy maintenance options in the form of a removable bottom panel. Overall, we believe the C405 can run games at a higher fps than its predecessor, although it achieves this result with higher emissions and power consumption. In all other areas, it is quite similar to the C404.